My goal was to get a photo of the shrine dedicated to the founding father of Koh Lipe, but like an Alice in Wonderland adventure, everyone I asked pointed me in a different direction. 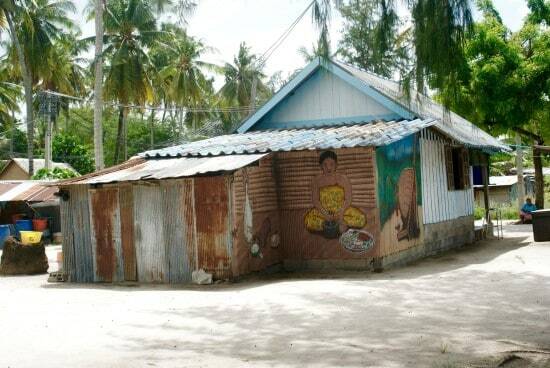 After my second sunbaked loop around one particular group of colorful tin-roofed buildings, I took my chances to enter the small village of the local Urak Lawoi sea gypsies and ask them about the shrine’s location. Uninvited ‘tourist’ meanderings into private homesteads, is in my book slightly intrusive. But apparently I was invisible. My non local appearance not a curiosity or even worth acknowledgment, as if by magic they were already expecting me or perhaps already accustomed to the intrusions of foreign tourists. I would prefer to think it was the former. Who could resist a house like this? 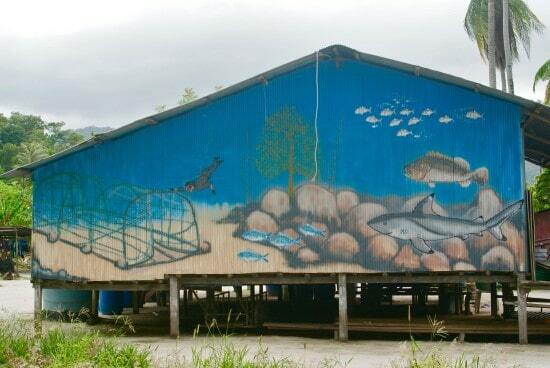 This past year, while researching for a small travel article, I was introduced to Project Urak Lawoi in Koh Lipe, Thailand. I had never heard about the Urak Lawoi, but I had certainly heard about ‘sea gypsies’. 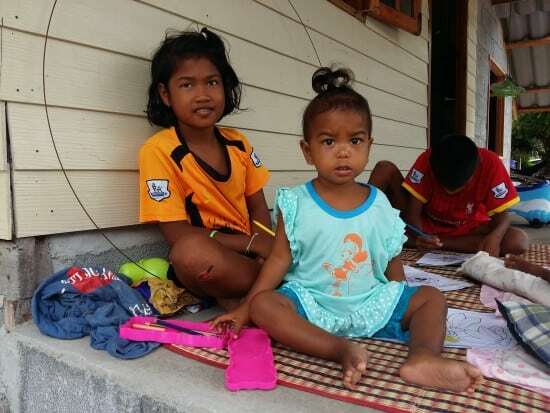 In fact the whole world became more aware of sea gypsies as the infamous 2004 Tsunami hit the shores of Thailand on that fateful day of December 26, 2004. 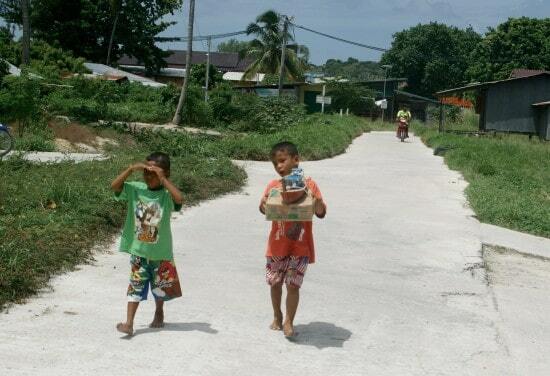 Relatively unknown to many, the Moken Sea Gypsies of that particular region were at a location hit the most fiercely by the Tsunami, yet they had no casualties. They had already read the signs of the sea and went to higher ground, because they knew the Tsunami was coming. The sea is the life force of the Urak Lawoi. Well over 10,000 Sea Gypsies (Chao Ley) call Thailand home, comprising three different ethnic groups; the Moken, the Moklen and the Urak Lawoi. The Urak Lawoi, a direct translation of urak (people) and lawoi (of the sea), is the largest of the three. This Sunday mini drum circle was a pleasant surprise. Fascinating and unique cultures within an already culturally rich Thailand. One would assume that these sea gypsy cultures would be embraced and admired by all. Except that nomadic sea tribes usually gravitate towards islands and the sea and in countries where tourism has a hefty investment in its beaches and island paradises, those with the deepest pockets will usually win the tug-of-war on beachfront properties and adjacent waterways. The future is getting brighter for these creative children. However, as more sea gypsies become educated about business, there is a show of growth in sea gypsy owned resorts, restaurants and various other local businesses. This is especially true in Koh Lipe, where their culture has become compromised by tourism developments. Their rich history is also interesting, due to the often overlapping histories between Southern Thailand and Malaysia, including neighboring Langkawi, Malaysia. As the legend goes, an explorer named To Kiri, from Aceh, Indonesia, is the credited with bringing the Urak Lawoi to Koh Lipe and the Adang-Rawi Archipelago. In the mid 1900s To Kiri had started a journey in search for a new location to settle. A location that was rich in natural resources. He and his two brothers initially traveled to Gunung Jerai, a mountain located in the state of Kedah, Malaysia. It was there he met and married a local Malay woman, with whom he had a daughter. While his brothers decided to settle in the Kedah mountain region, To Kiri and his new family and a few friends moved north through the Andaman Sea, making stops along the way in Langkawi, Lidi and Bulon islands. It was at Bulon where To Kiri’s wife died so he continued onward to Koh Lanta. In Koh Lanta, To Kiri met and married an Urak Lawoi woman and was encouraged by his friend Praya Poomnardpakdee, the chief of Satun (1900-1914) to bring his new family as well as other Urak Lawoi back down to Satun province to settle. At the time the Thai government also needed to prove to Malaysia’s British colonial administrators that the Adang Archipelago belonged to Thailand because a Thai population had settled there during the period when national borders were being established in 1909. Over the next few decades, more Urak Lawoi joined To Kiri in the Adang Archipelago, where he was eventually appointed the first village head of Lipe Island. Among the Urak Lawoi, To Kiri is considered their most respected ancestor. Even the houses have a story to tell. But today, the Urak Lawoi way of life has changed due to the National Marine Park, the massive influx of tourists, and competition with big money resorts and commercial fisheries. However, under Project Urak Lawoi, an improved education system and the encouragement to preserve their traditional ways is helping the Urak Lawoi families become stronger in the community while maintaining great pride in their culture and heritage. Mealtime preparations that I didn’t stay to watch. Did I eventually visit the shrine? No. To be honest I felt as if I’d been intrusive enough just by taking photos. Would I like to learn more about the traditional ways of the Urak Lawoi and other sea gypsy tribes? Absolutely, but in a respectful way that is a win-win for both of us. There is a fine line between cultural exchanges and being exploited in a ‘human zoo’ way, so I’m willing to wait for a proper invitation or opportunity. The sea is their past, present and hopefully their future. 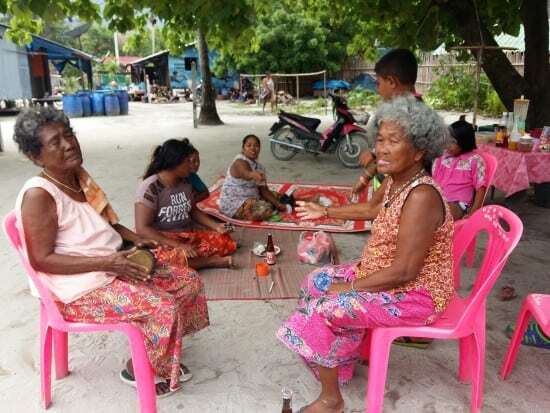 How can you help the Urak Lawoi of Koh Lipe become stronger in their community and keep their heritage alive? By seeking out the Urak Lawoi owned and operated businesses and support them with your patronage. Interesting article. I’ve heard that the Urak Lawoi left Lanta for the Adang archipelago to escape military conscription in the early 1900s… My guess is the truth lies somewhere between that and what’s mentioned here about Siam trying to settle the area. Tourism has definitely had a major impact on Urak Lawoi culture, but also the nationalist Thai education system has done a number on it. 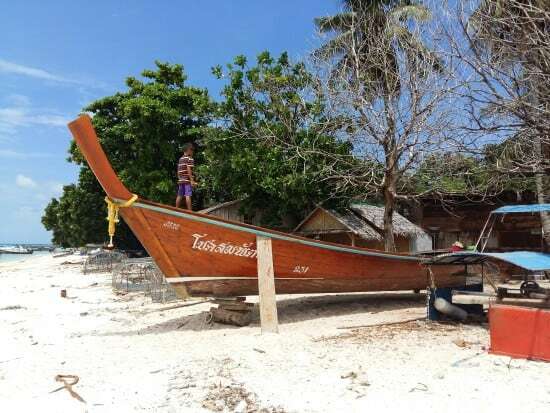 I’ve been told that quite a few young Urak Lawoi people on Lipe can’t speak their own language anymore, so it’s good to hear that there’s an initiative to preserve the culture (I know there’s a similar push up on Lanta). When on Lipe, stop by Gipsy Resort on Sunrise Beach and have a chat with the owner (his name is Prom I think, he usually hangs around reception); he’s a university-educated Urak Lawoi from Lipe who speaks excellent English and has been really open about discussing his people/culture. Informative article. I will share this. Great article. It’s really interesting to read about the Sea Gypsies. It’s hard to find good information about them, and even most people living on Koh Lanta don’t really know much about their culture and history, which is a shame. Actually, we should try to find out more about the Chao Ley on Koh Lanta and write a post about them! Hey Vanessa, this was really interesting, thanks. We’re traveling in Thailand at the moment but not sure we’ll be anywhere near Koh Lipe. Thanks!You can also meet Urak Lawoi sea gypsies in Koh Lanta, their village is near Old Town.